Jack Wiley, Ph.D., is founder and executive director of the Kenexa High Performance Institute, the R&D arm of a leading provider of business solutions for human resources. He is recognized internationally for groundbreaking research that links employee survey results to measures of customer satisfaction and financial performance. A keynote speaker at conferences around the world, Dr. Wiley shares his research findings and advice with thousands of HR professional and business leaders every year. Brenda Kowske, Ph.D., is a manager and research consultant for the Kenexa High Performance Institute. Kowske is a highly respected researcher in the field of HR and, through her management of the WorkTrends study, investigates timely topics that inform talent management practices around the world. She has worked as a coach, trainer, and performance management consultant for Fortune 500 companies. Chapter 1: What Employees Really Want. Chapter 2: Why You Should Care. Chapter 5. Security of Employment. Chapter 7. Education and Career Growth. Chapter 8. Conditions at Work. 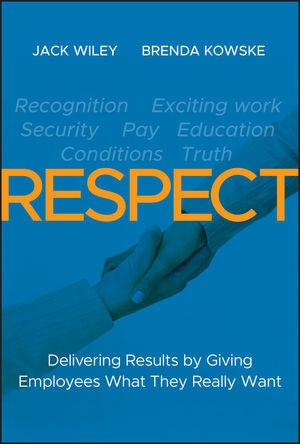 Chapter 10: RESPECT: A Key to Your Future Success. Appendix A. Identifying RESPECT Levels Worksheet. Appendix B. About the WorkTrends Study. Appendix C. Discovering the RESPECT Taxonomy: The Method.